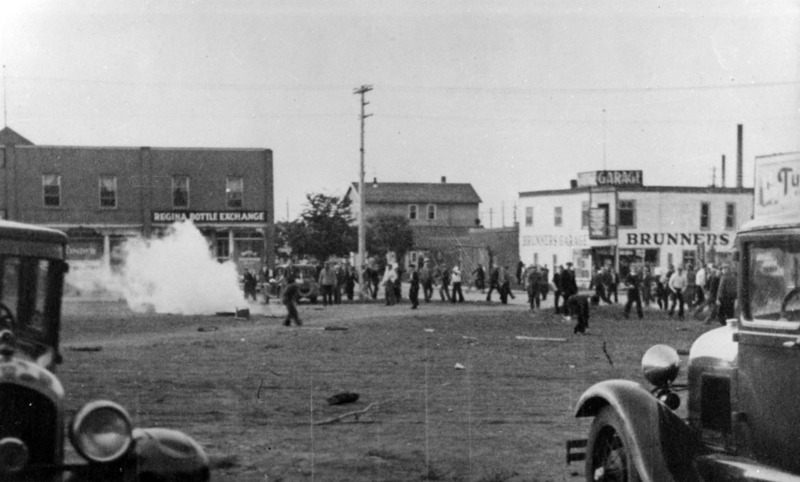 Street riot among police and striking relief camp workers in Regina, 1935. Source: Royal Canadian Mounted Police / Library and Archives Canada / e004666104. During the Great Depression, the Canadian government did not introduce significant policy innovations to address the economic crisis. The most substantial program the government pursued was the development of a series of remote work camps for unemployed men across the country. Upon the recommendation of Major-General Andrew McNaughton in late 1932, Prime Minister Richard Bennett approved the establishment of relief camps under the administration of the Department of Defence. Typically, these camps offered subsistence in the form of food and shelter in exchange for often hard labour in remote rural districts of Canada. Men worked on a number of projects including, road building, logging, clearing bush, building airports, and even developing national parks. The relief camps became a major controversy for the Canadian government due to the low pay and poor working conditions at many of the camps. A strike and walkout by relief camp workers in British Columbia in April 1935 led to street protests and occupations in Vancouver that spring. The Canadian government appointed a three-man commission of inquiry to investigate the conditions in the relief camps of British Columbia and explore the complaints of the striking workers. In this module, you will read the final report of this commission, which was issued in late May 1935, not long before the commencement of the On-To-Ottawa Trek and the Regina police riot. In the Matter of the Commission on Relief Camps, British Columbia: Report. Ottawa: 1935.